Professor Nelson received his Ph.D. from Queen's University in 1984. He subsequently held a postdoctoral fellowship at MIT (Center for Space Research) that led to pioneering work on the structure and evolution of a completely new class of substellar objects known as Brown Dwarfs. From 1986-1988 he was a research fellow at CITA (Canadian Institute of Theoretical Astrophysics). 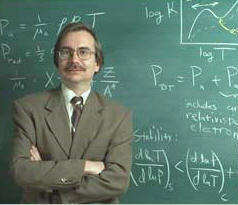 He joined the department of physics at Bishop's as an Assistant Professor in 1988 and became a full Professor in 1998. From 1996-1998 & 1999-2001, he served as Chair of the physics department. It is our understanding of the properties and evolution of stars that gives us unique insights into the age, scale, and structure of the Universe. Most stars reside in "wide" binary systems but some of the most important and exotic phenomena are observed in interacting binary systems. They span the range from black-hole binaries to contact binaries. These systems are rich in physics (e.g., radiative hydrodynamics, thermonuclear runaways, the properties of dense matter) and can be used as a laboratory in which we can test predictions from a diverse group of fields such as general relativity and high energy physics. The primary focus of Professor Nelson's research is centered on the theory associated with the structure, formation, and evolution of very-low to intermediate mass stars in close binary systems containing compact stars  white dwarfs, neutron stars, and black holes. (iii) enumerate the probabilities associated with detecting the various types of "end-products" (remnants) resulting from the evolution of these systems. Although the theoretical picture is based on a combination of population synthesis and stellar evolution techniques, its validity needs to be tested rigorously. For example, the observed numbers and frequency distribution of the various types of binaries can be compared with the theoretical predictions. Moreover, the properties of the various phenomena associated with different phases of binary evolution (e.g., stable nuclear burning on the surface of white dwarfs [as opposed to Novae], or the existence of a "period gap" in Cataclysmic Variables) can be compared with what is seen observationally. Thus comparison using observational results from a wide variety of instruments such as the HST, Chandra, KECK, Gemini and SIRTF is essential. carrying out population syntheses to analyze the expected count data for a comprehensive set of scenarios leading to the formation of brown dwarfs and planetary-mass objects. This is particular timely given the recent launch of the Spitzer Space Telescope (SST). The results of the deep imaging IR surveys will be combined with those of other surveys (2MASS and DENIS) will result in statistically significant counts of substellar objects in the solar neighborhood and in clusters. To assist the efforts of various international collaborations working on problems related to interacting binary evolution we have developed the Bishop's University Interacting Binary Evolution Server that will allow scientists to download specific evolutionary tracks from an archive of data (and, in addition, request completely new evolutionary results). Sylvain Turcotte [Bishop's]: The Bishop's group has become affiliated with the ASCI consortium and will be using the FLASH code to simulate nova-related phenomena on hydrodynamic timescales. The physics of chemical diffusion is also being incorporated in an interacting binary code to investigate the properties of hydrogen shell flashes that occur in some binary millisecond pulsar systems. Ernest Dubeau [Bishop's]: Current investigations are focused on the origin of Red Stragglers in globular clusters. This work is also related to a model being devised to explain the 'period gap' in the orbital period distribution of (wide) low-mass binary pulsars. Michel Barrette [U. Sherbrooke/Bishop's] has been working in conjunction with the CCS team (under the direction of Alain Veilleux) to build and expand a Beowulf type cluster (Elix2) using the OSCAR software suite. The cluster has been constructed in collaboration with Andr�-Marie Tremblay at the University of Sherbrooke. Saul Rappapport [MIT]: Population synthesis techniques are being used to determine the formation probabilities of ultracompact binaries (e.g., accreting millisecond pulsars) according to the TAMS-NS scenario. A simplified stellar evolution code ("FastCode") is currently being tested and its purpose is to allow population syntheses to be carried out more efficiently. The evolutionary pathways leading to the formation of neon-enriched degenerate donors in ultracompact X-ray binaries is also being investigated (in conjunction with graduate student Adrienne Juett). Chris Deloye & Lars Bildsten [UCSB]: The thermal properties of hydrogen-depleted and pure-helium dwarfs in ultracompact binaries are being studied in order to gain more insight into the evolution of AM CVn-type systems. (1) A Beowulf cluster that allows researchers to carry out multi-scalar (and in some cases parallel) numerical simulations. This technologically innovative cluster is being built in conjunction with the Centre de calcul scientifique (CCS) at the Universit� de Sherbrooke and with the collaboration of Prof. Andr�-Marie Tremblay. The cluster (Elix2) now consists of about 200 nodes each powered by an Intel Pentium 4 CPU (~2.4GHz). Because this cluster has been assembled from generic-source components, it is an extremely cost-effective solution for researchers requiring intensive, large-scale numerical computations. It has already been heavily used by international collaborators of researchers at both Bishop's and the U. de Sherbrooke. (2) The creation of a high-performance computing (HPC) environment that allows researchers working in the area of theoretical astrophysics to develop computer simulations that will give us a better understanding of the properties and evolution of interacting and exploding stars (such as supernovae). 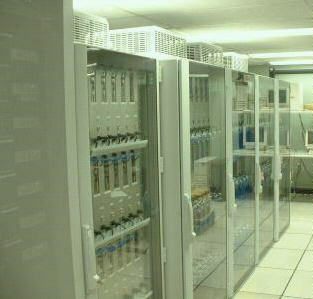 The main servers (SunBlade 2000s) were manufactured by Sun Microsystems and have been completely installed and configured. These computers can communicate with other computers both on and off campus using a Gigabit ethernet connection. To fully utilize this bandwidth capability, a Gigabit "blade" was purchased collaboratively using funds from this project and Bishop's University. Thus all computer users at Bishop's (e.g., professors, researchers, and students) can benefit from a superior level of service. Another innovative aspect of this project was the installation of videoconferencing tools that give researchers the ability to communicate more easily with colleagues outside of the University. "On the Detectability of Brown Dwarfs: Predictions and Uncertainties", NELSON, L.A., Dubeau, E. & MacCannell, K. Astrophysical Journal, 404, 723. (1993). A data server giving scientists the ability to retrieve archival evolutionary tracks of low-mass interacting binaries containing compact objects and to request the computation of new tracks. A variety of high- and low-resolution animations showing the evolution of interacting binaries that leads to the formation of a binary millisecond pulsar or ultrashort-period accreting millisecond pulsars. Where are They (Former Students) Now? The following is an abbreviated list of former students and their current positions/accomplishments. They were either thesis students or worked as summer (undergraduate) research assistants.